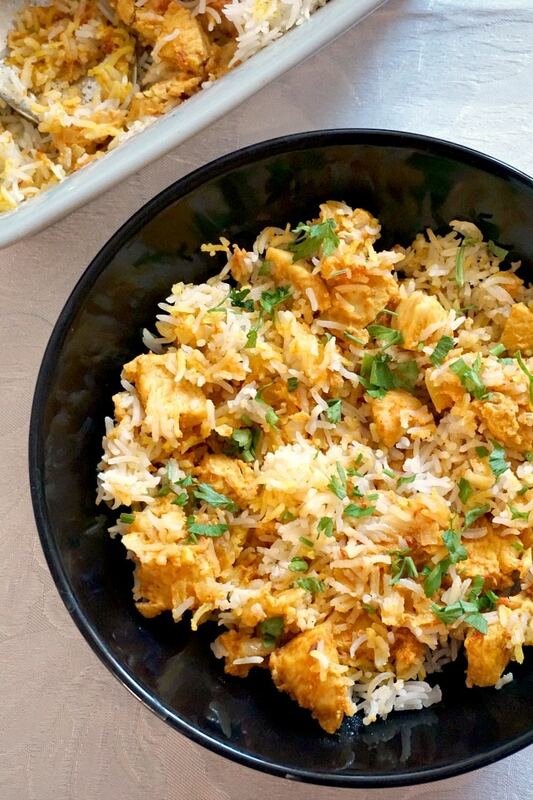 This Chicken Biryani recipe makes a delicious dinner that is bursting with flavour. 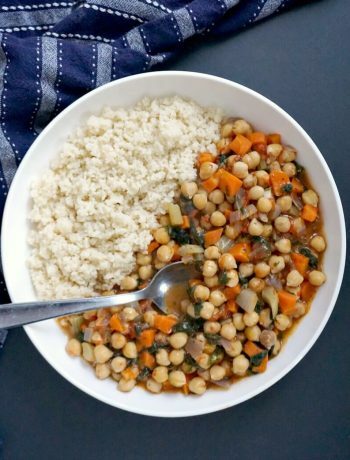 A lot easier to make than you would think, this dish is sheer goodness. Chicken biryani is one of my favourite Asian-inspired dishes. Biryani, also spelt biriyani or biriani, is so popular all over the world, and, in spite of the fact that there are so many variations of this dish, one thing is sure: you can never go wrong with an easy chicken biryani recipe, no matter how you cook it. Whether you go for a strong-flavoured or a mild version, be it chicken, mutton, lamb and so on, you know you have hit the jackpot; one delicious meal for you to enjoy. The main ingredients are rice, meat and seasoning, and here it is entirely up to you how little or how much you use. If you use rather mild spices, kids ca definitely enjoy it too. 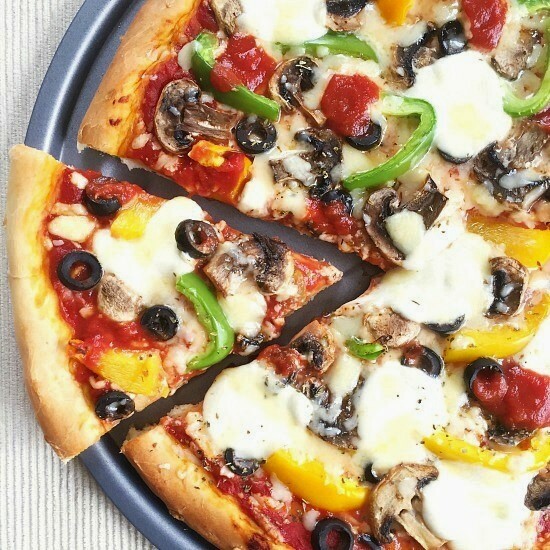 I usually make enough for about 2-3 people, since little ones don’t eat that much, so feel free to double up the amount of ingredients if you are cooking for a larger crowd. This super easy chicken biryani recipe can be ready in way under one hour, and no planning in advance is needed. Just make sure the rice is nearly boiled, but not completely done, as this is will cooking further in the oven, and become nice and fluffy. I’m not quite a huge fan of super strong seasoning, so my version is pretty mild. l also avoided chilli. I am also a bit paranoid when it comes to chicken, l tend to cook it for a lot longer than required, just in case, l’d rather not worry about uncooked meat. It is probably worth mentioning that this chicken biryani is my take on this classic dish, and will never claim as it being original. But, you know what, it is absolutely fantastic and l’m sure you’ll love it. Nothing wrong with making a dish your own by adapting it to your own taste. Like my butter chicken, this too is the perfect homemade version of the so loved recipe. 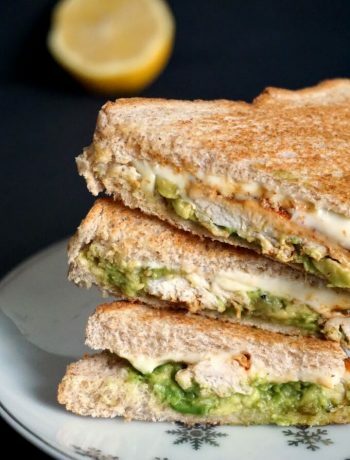 Homemade food can never be beaten, isn’t it? You can also use saffron to make it even more flavourful, I know it’s a tad expensive, but I guess if you use it in many other dishes, it’s worth the extra expense. Otherwise, just a bit of turmeric with milk can be drizzled over the rice to give it that dinstinctive biryani touch. I used diced chicken breast, but you can also use drumsticks, thighs, or whole chicken legs. If I were to choose a different meat to make biryani, I think I would defintiely go for beef, although the cooking time will be a lot longer, in order to get the beef tender. But, a good dish is worth the extra cooking time, isn’t it? 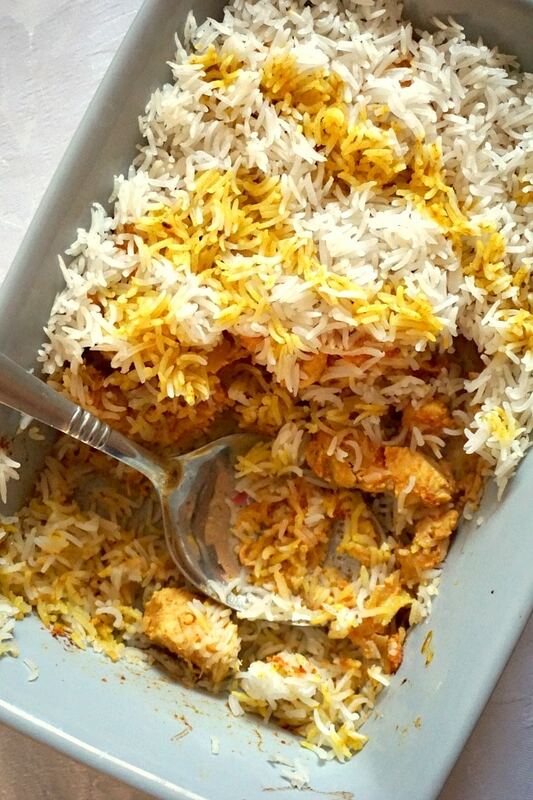 If you’ve tried my EASY CHICKEN BIRYANI RECIPE or any other recipe on the blog then don’t forget to rate the recipe and let me know how you got on in the comments below, I love hearing from you! You can also FOLLOW ME on FACEBOOK, and PINTEREST to see more delicious food and what I’m getting up to. 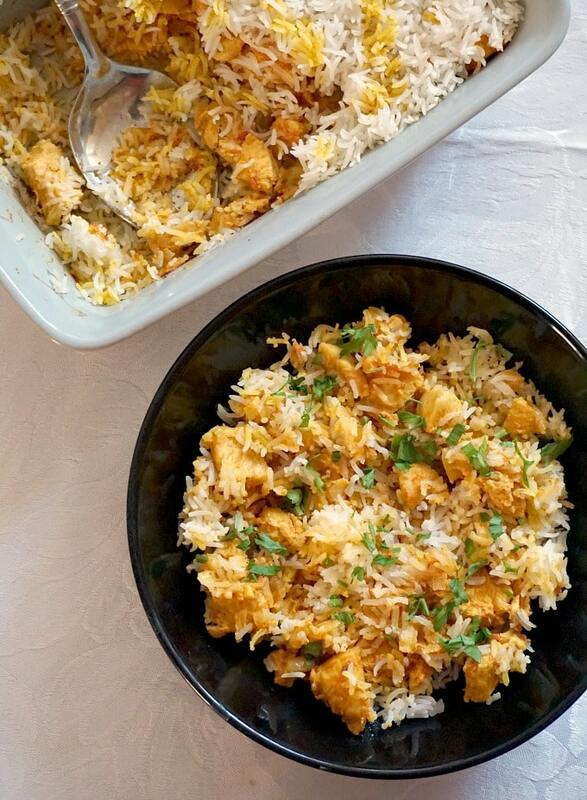 Easy chicken biryani recipe, a fantastic dish to feed the whole family. Rinse the rice with plenty of cold water and set aside. Dice the chicken breasts and tranfer to a large bowl. Add the yogurt, ground black pepper, curry powder, ground cumin and mix well so that the chicken is well coated. Cut the onion, garlic cloves and ginger, then heat up the oil in a pan and fry them until golden. Chop the tomatoes and add them to the pan, they should be cooked for 3-4 minutes until mushy. In goes the chicken, stiring well. 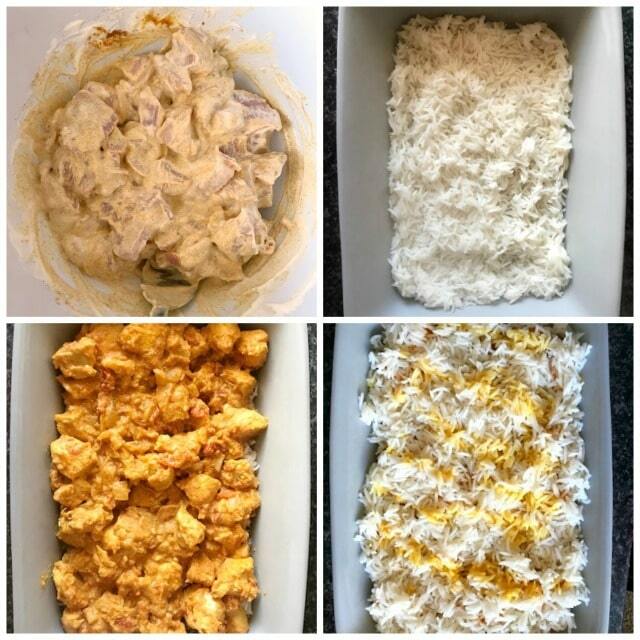 Leave to cook for 5 minutes, then add 1/2 cup of water. Bay leaves and salt can be added too. Cover with a lid and leave it to cook until the liquid is absorbed. Meanwhile, cook the rice with 2 cups of cold water until it comes to a boil. At this stage the rice should be about 70/80 % cooked. 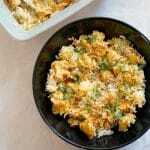 In an oven-proof dish that has a lid, arrange one layer of rice, one layer of the cooked chicken and again one layer of rice. Add one tbsp of milk, one tbsp of water and the turmeric to a cup, then drizzle some over the rice. Cook in the oven with the lid on for about 20-30 minutes, the rice will become fluffy and fully cooked. Carefully remove from the oven, and use a fork to gently mix the chicken and rice. Nice chicken biryani pic ☺…i like those brown fried onions on top.